Racing heart. Sweat. Labored breathing, Uncontrollable crying. Chest tightening. You feel like you're going to DIE. Your body is reacting to perceived danger in your brain. Your unconscious mind has picked up a signal that you are unsafe and your body needs to activate for protection. When your brain senses danger, a messenger relays that information to your amygdala from your brain stem before your cerebral cortex can process it and make sense of it logically. The message is Fight. Flight. or Freeze. What are "threats" or "perceived dangers" to the brain? 1. Threats to basic human needs both physiological and safety needs. Not only are traumatic experiences threatening, but physiological and love needs can also trigger a response. H.A.L.T stands for Hungry, Angry, Lonely, Tired. Are you feeling any of these? 2. "Shoulds." The "shoulds" are expectations you tell yourself. I should be more...I should have done this...I shouldn't be like that...I should...I should...I should. Go ahead--start writing a list of your "shoulds" as you realize them. We all have the "shoulds." 3. The Unknown. The unknown can be frightening. The unknown of the future. Of the unexpected. Of how your body will respond. Of outcomes. Unpredictability. Really, the unknown can go on for infinity. 4. Contradictory Messages in the Environment: Mixed messages in an environment are threats to the brain. Double standards. Unpredictability. For example: A parent who either encourages or "forces" a child to do an activity, and then criticizes his effort. Or a partner who is a completely different person under the influence of alcohol. 5. Implicit Memories. These are memories that rise to the "surface" of the brain, although are not recognized as a memory. It is when something happening now stirs up a memory from the past when you felt similarly--even though the current situation may be completely different. There is no time stamp either. For example, a scent associated with a past event may bring about an emotional response, yet the individual is unaware that scent was associated with the memory. This physical response to a perceived threat is called dysregulation, and it happens to both children and adults. The difference for a child though, is typically, he/she does not have the tools and skills to express this intense whirlwind. He/she often shuts down or acts out in order to release or suppress that energy. What may look like defiance is actually a physiological response to perceived danger. Defiance is intentional and motivated by a desired outcome. 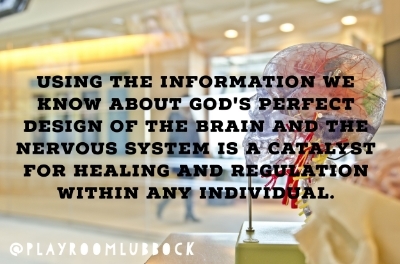 Dysregulation is governed by the nervous system. Try telling a dysregulated nervous system that "there is nothing to be afraid of" or to simply "calm down." Or "he just needs a spanking." It's like sending an email through the mailbox in your front yard. You're sending a message through the wrong channels in the brain. We are all very much aware when a dysregulated individual is in a hyper-aroused state: Aggression, disorganized, alert, excessive motor activity, uncontrollable, irritable, anxious. But, a hypo-arousal state looks and feels much differently. It's easier to misperceive. Tired, automatic obedience, appears life-less, non-expressive, numb, lack of motivation, isolated, helplessness. Mindfulness is key. Mindful awareness practices activate and harness the power of the prefrontal cortex in order to respond more effectively. As you repeatedly practice something, that state becomes a trait. You rewire your neurons. How cool is that?! Daniel Siegel discusses this here. Mindfulness is simply recognizing what's going on inside (our internal experience) in order to shift our internal experience. When we are more aware of what is happening on the inside, then we have more freedom to make a different choice in our response. This self-awareness allows people to stay connected to themselves in overwhelming moments. Self awareness allows the brain to think rationally, thus giving more choice and control over a response. Modeling is the best way to teach mindfulness. Check in with yourself throughout the day, particularly with your body. Notice what is happening to your body in regards to temperature, sensations, and movement. What parts are tight or clenched? What parts are relaxed? Notice and breathe. We want our mind to be an active participant--when we bring our attention to our body, our brain is less likely to "jump to conclusions" about what is happening in the situation or in the environment. The more we model and teach our children to be mindful of the body, overtime, patterns that we have been stuck in, will begin to soften and release. 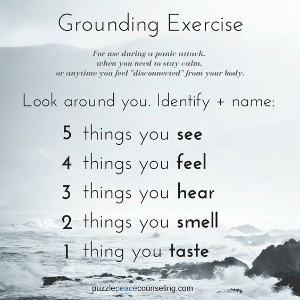 Grounding exercises are designed to bring your awareness into the present moment which reminds our bodies that we are actually safe from harm. Adrenaline and cortisol then can be reduced. Lisa Dion compiled a list of activities to help return our bodies to a more regulated state. A healthy and effective therapeutic relationship with a counselor will provide an opportunity for you to examine and understand your perceived threats in a safe, empathic relationship and environment. For children, therapy involving play, sand, and activities will increase self-awareness, acceptance, regulation, and self-control. A therapeutic relationship can connect at both the brain and heart levels that promotes new growth and neural pathways in the brain as well as heal any hurts in the heart.